The CAR5140.FC8164 TAG Heuer Carrera Mikrograph 1/100th Chronograph Rose Gold 150 Years Limited Edition Men’s Watch is part of the latest additions to the Carrera line, and was recently debuted at the Basel Fair in Switzerland. A decadent tribute to the Carrera heritage not yet available to the public, this watch will surely be snatched up by collectors when it is released in October of 2010. The TAG Heuer Carrera Mikrograph 1/100th Chronograph Rose Gold 150 Years Limited Edition is a masterpiece of a heritage watch. Much of the watches components are made from 18K rose gold and hand-applied or hand-finished: the 1/100th second and 30 minute chronographs at 6 and 3 o’clock, respectively; the power reserve indicator at 12 o’clock; the Arabic numbers; the skeleton hour and minute hands; the case; the case back, complete with sapphire crystal that allows wearers to see the two balanced wheels for the both the chronograph and the watch; the push buttons; and the crown. Housed within this small treasury is the Calibre 360 movement, which moves at a staggering 360,000 beats per hour. The movement also features oscillating weights that can be personalized. 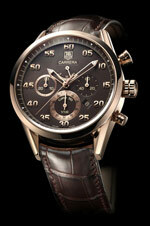 Other features of merit on the Carrera Mikrograph include a black alligator strap and a 18K rose gold folding clasp. The watch is water resistant to 50 meters. Hello there, just browsing for information for my Tag Heuer site. Amazing the amount of information on the web. Not what I was looking for, but great site. Have a nice day.